The perfect warming winter treat. Heat oven to 190°C/Fan 170°C /Gas 5. Mix flour and sugar into a large bowl. Add the butter, then rub into the flour using your fingertips to make a light breadcrumb texture. For the fruit mixture, peel, core and slice apples. Put the butter and sugar in a medium saucepan and melt together over a medium heat. Cook for approx 3 mins until the mixture turns to a light caramel consistency. Stir in the sliced apples and cook for 3 mins. Add the blackberries and cinnamon, and cook for a further 3 mins. Spoon the warm fruit into an ovenproof dish, top with the crumble mix, then place in the oven for 5-10 mins at 190°C/Fan 170°C /Gas 5. Easy to follow recipe. Not too many ingredients so it’s not complicated. 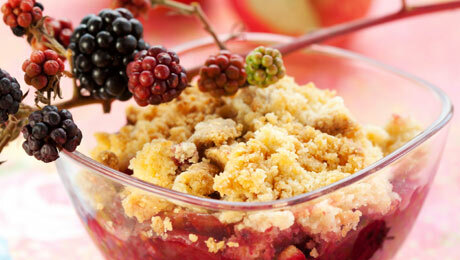 Delicious crumble.